"BART" redirects here. For other uses, see BART (disambiguation). Bay Area Rapid Transit (BART) is a rapid transit public transportation system serving the San Francisco Bay Area in California. The heavy rail elevated and subway system connects San Francisco and Oakland with urban and suburban areas in Alameda, Contra Costa, and San Mateo counties. BART serves 48 stations along six routes on 112 miles (180 km) of rapid transit lines, including a ten-mile spur line in eastern Contra Costa County which utilizes diesel multiple-unit trains and a 3.2-mile (5.1 km) automated guideway transit line to the Oakland International Airport. With an average of 423,000 weekday passengers and 124.2 million annual passengers in fiscal year 2017,  BART is the fifth-busiest heavy rail rapid transit system in the United States. BART is operated by the San Francisco Bay Area Rapid Transit District, formed in 1957. The initial system opened in stages from 1972 to 1974. As of late 2019, it is being expanded to San Jose with the Silicon Valley BART extensions. Formal planning for BART began with the setting up in 1957 of the Bay Area Rapid Transit District, a county-based special-purpose district body that governs the BART system. The district initially began with five members, all of which were projected to receive BART lines: Alameda County, Contra Costa County, the City and County of San Francisco, San Mateo County, and Marin County. Although invited to participate, Santa Clara County supervisors elected not to join BART due to their dissatisfaction that the peninsula line only stopped at Palo Alto initially, and that it interfered with suburban development in San Jose, preferring instead to concentrate on constructing freeways and expressways. Though the system will expand into Santa Clara County in 2019, it is still not a district member. Passenger service began on September 11, 1972, initially just between MacArthur and Fremont. The rest of the system opened in stages, with the entire system opening in 1974 when the transbay service through the Transbay Tube began. The new BART system was hailed as a major step forward in subway technology,  although questions were asked concerning the safety of the system  and the huge expenditures necessary for the construction of the network. Ridership remained well below projected levels throughout the 1970s, and direct service from Daly City to Richmond and Fremont was not phased in until several years after the system opened. BART has also been studying ways to improve service and reliability in its core system, where density and ridership is highest. Recent exploratory ideas have included a line that would continue from the Transbay Terminal through the SOMA district, northwards on Van Ness and terminating in western San Francisco along the Geary corridor, the Presidio, or North Beach. Since the mid-1990s, BART has been trying to modernize its system. The fleet rehabilitation is part of this modernization; in 2009, fire alarms, fire sprinklers, yellow tactile platform edge domes, and cemented-mat rubber tiles were installed. The rough black tiles on the platform edge mark the location of the doorway of approaching trains, allowing passengers to wait at the right place to board. All faregates and ticket vending machines were replaced. During the 1989 Loma Prieta earthquake, the BART equipment was mostly undamaged. A 2010 study  shows that along with some Bay Area freeways, some of BART's overhead structures could collapse in a major earthquake, which has a significant probability of occurring within three decades. Seismic retrofitting has been carried out in recent years to address these deficiencies, especially in the Transbay Tube. The main system uses a 5 ft 6 in (1,676 mm) broad gauge  and mostly ballastless track. Originally utilizing flat-edge rail and wheelsets with cylindrical treads, BART is now switching to conical tread to reduce the noise caused by flange/rail contact and loss of adhesion of one of the wheels on curves. DC electric current at 1,000 volts is delivered to the trains over a third rail. An automated guideway transit line and an additional station were opened in 2014 and utilize off-the-shelf cable car technology developed by DCC Doppelmayr Cable Car: the Cable Liner. The section of the Antioch-SFO/Millbrae line east of the Pittsburg/Bay Point station runs on conventional unelectrified 1,435 mm (4 ft 8 1⁄2 in) standard gauge rail. Location of the third rail changes at the station. On the left side of the track in the distance is the emergency walkway — the third rail is across the track from this walkway. Many of the original 1970s-era stations, especially the aerial stations, feature simple Brutalist architecture, but newer stations are a mix of Neomodern and Postmodern architecture. The additional double tracked four mile long upper deck of the Market Street Subway and its four underground stations were built by BART for the S.F. Municipal Railway. Richmond–Warm Springs/South Fremont line September 11, 1972 R-Line, K-Line, A-Line, S-Line Operates during all service hours. Antioch–SFO/Millbrae line May 21, 1973 C-Line, K-Line, M-Line, W-Line, Y-Line, eBART Terminates at San Francisco International Airport on weekdays and Sundays, and at Millbrae (via the airport) on nights and Saturdays. Uses DMU technology from Antioch to Pittsburg/Bay Point. Warm Springs/South Fremont–Daly City line November 16, 1974 S-Line, A-Line, M-Line No evening service; limited Sunday service. Richmond–Daly City/Millbrae line April 19, 1976 R-Line, K-Line, M-Line, W-Line Terminates at Millbrae on weekdays and at Daly City on Saturdays; no evening service; limited Sunday service. Dublin/Pleasanton–Daly City line May 10, 1997 L-Line, A-Line, M-Line Operates during all service hours. Sunday service runs to MacArthur station rather than Daly City. SFO–Millbrae line February 11, 2019 (previously 2003–2004) W-Line, Y-Line No weekday evening or Saturday service. Coliseum–Oakland International Airport line November 22, 2014 Separate elevated automated guideway transit line (H-Line) not connected to other BART tracks Operates during all service hours. BART was one of the first U.S. rail transit systems of any size to be substantially automated. Routing and dispatching of trains, and adjustments for schedule recovery are controlled by a combination of computer and human supervision at BART's Operations Control Center (OCC) and headquarters at the Kaiser Center in Downtown Oakland. Station-to-station train movement, including speed control and maintenance of separation between successive trains, is entirely automatic under normal operation, the operator's routine responsibilities being issuing announcements, closing the doors after station stops, and monitoring the track ahead for hazards. In unusual circumstances the operator controls the train manually at reduced speed. 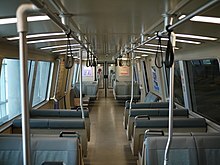 Side view of nine car BART C1 train. The Coliseum–Oakland International Airport line uses a completely separate and independently operated fleet as it uses cable car-based automated guideway transit technology. It uses four Cable Liner trains built by DCC Doppelmayr Cable Car, arranged as three-car sets, but the system can accommodate four-car trains in the future. Bombardier D 310 3xxx 2012– Scharfenberg Order being filled/testing, entered service on January 19, 2018. The first maintenance yards built for the core BART system were in Richmond, Concord, and Hayward. As part of the SFO extension, an additional yard was added at the Colma station. A yard will open at the planned Santa Clara station in 2026, upon completion of Phase II of the Silicon Valley BART Extension. The Coliseum–Oakland International Airport line utilizes Doolittle Maintenance and Storage Facility as a car barn for the line's guideway trains. eBART trains utilize a facility in Antioch for maintenance and service. BART has six rapid transit services (five primary services plus the SFO–Millbrae shuttle); all six lines share track with other lines. As BART operates between the traditional rapid transit and commuter rail service types, frequencies are lower than most rapid transit systems. Trains on each primary service run every 15 minutes on weekdays (with some additional peak-hour trains on the Antioch–SFO/Millbrae line), every 24 minutes on weekday evenings, and every 20 minutes on weekends and holidays; the shuttle runs every 30 minutes on weekdays and every 20 minutes on weekends. Segments served by multiple lines have higher frequencies, the busiest of which is the section between Daly City and West Oakland, which has around 20 trains per hour per direction at peak hours. The eBART section of the Antioch–SFO/Millbrae line matches the frequency of the rest of the line, except for peak hours when it runs every 15 minutes. The Coliseum–Oakland International Airport line runs every 6 minutes until 11:00 pm and approximately every 18 minutes thereafter. The first inbound trains leave outer terminals around 5:00 am on weekdays, 6:00 am on Saturdays, and 8:00 am on Sundays and most holidays. (The previous 4:00 am weekday start time was changed to 5:00 am for three years starting on February 11, 2019 to accommodate retrofitting of the Transbay Tube. That project also reduced weekday evening service from every 20 minutes to every 24 minutes to allow for construction work in one track of the Tube during those times.) The last inbound trains leave their terminals around midnight, with the final Antioch–SFO/Millbrae line and Richmond–Warm Springs/South Fremont line trains in both directions meeting at MacArthur station for guaranteed transfers. Three of the six rapid transit services do not operate during some service hours, though all stations are served at service hours. The Warm Springs/South Fremont–Daly City line has limited Sunday service and does not run after about 6:00 pm on weekdays. The Richmond–Daly City/Millbrae line has limited Sunday service and no service after 9:00 pm on weekdays; it runs a shorter route on Saturdays. The SFO–Millbrae shuttle does not run on Saturdays nor after 9:00 pm on weekdays. On Sundays, the Dublin/Pleasanton–Daly City line runs to MacArthur station rather than to Daly City station to allow for single-track operations in the Market Street Subway. BART relies on unused ticket values on discarded low-value cards for additional revenue, as much as $9.9 million. The paper ticket technology is identical to the Washington Metro's former paper fare card, though the BART system does not charge higher fares during rush hour. Clipper, a contactless smart card accepted on all major Bay Area public transit agencies, may be used in lieu of a paper ticket. A standard-fare BART ticket. The initial purchased fare is printed parallel to the magnetic strip, and the card's remaining balance is printed on the left, updated upon each exit. The minimum fare is $2.00 (except San Mateo County trips) under 6 miles (9.7 km). The maximum one-way fare including all possible surcharges is $16.15, the journey between San Francisco International Airport and Oakland International Airport. The farthest possible trip, from Antioch to Millbrae, costs less because of the $4 additional charge added to SFO trips and $6 additional charge added to OAK trips. Entering and exiting the same station within three hours accrues an excursion fare of $5.75. Passengers without sufficient fare to complete their journey must use a cash-only AddFare machine to pay the remaining balance in order to exit the station. Special color-coded tickets provide steep discounts for children, the disabled, seniors, and students. BART Plus, a special high-value ticket with "flash-pass" privileges with some regional transit agencies, is being phased out in favor of the Clipper system. Unlike many other rapid transit systems, BART does not have an unlimited ride pass, and the only discount provided to the public is a 6.25% discount when "high value tickets" are purchased with fare values of $48 and $64, for prices of $45 and $60 respectively. Amtrak's Capitol Corridor and San Joaquins trains sell $10 BART tickets on board in the café cars for only $8,   resulting in a 20% discount. A 62.5% discount is provided to seniors, the disabled, and children age 6 to 12. Middle and high school students 13 to 19 may obtain a 50% discount if their school participates in the BART program; these tickets are intended to be used only between the students' home station and the school's station and for transportation to and from school events. The tickets can be used only on weekdays. These School Tickets and BART Plus tickets have a last-ride bonus where if the remaining value is greater than $0.05, the ticket can be used one last time for a trip of any distance. Most special discounted tickets must be purchased at selected vendors and not at ticket machines. The BART Plus tickets can be purchased at the ticket machines. Fares are enforced by the station agent, who monitors activity at the fare gates adjacent to the window and at other fare gates through closed circuit television and faregate status screens located in the agent's booth. All stations are staffed with at least one agent at all times. For most of its history, BART's ridership has reflected the U.S. economy, growing modestly during periods of economic expansion and dropping slightly during recessions. A major exception occurred in 1989 in the aftermath of the Loma Prieta earthquake, which severely damaged the San Francisco–Oakland Bay Bridge, causing its closure for a month. BART became the only direct route between the East Bay and San Francisco, resulting in a nearly 17% ridership jump for the 1990 fiscal year. Ridership did not drop back to previous levels after the repair of the bridge, suggesting that many commuters chose to stick with BART. Connections to local, regional, and intercity transit - including bus, light rail, commuter rail, and intercity rail - are available across the BART system. BART also runs directly to two of the three major Bay Area airports: San Francisco International Airport and Oakland International Airport. Three Amtrak intercity rail services - the California Zephyr, Capitol Corridor, and San Joaquin - stop at Richmond station; the Capitol Corridor also stops at Oakland Coliseum station. The Oakland – Jack London Square station and Emeryville station hubs, which are served by those three routes plus the Coast Starlight, are not located near BART stations. Amtrak Thruway Motorcoach also stops at several BART stations. Connection between BART and Caltrain commuter rail service is available at Millbrae station. Free shuttle bus service runs from Altamont Corridor Express (ACE) commuter rail stations to West Dublin/Pleasanton, Dublin/Pleasanton, and Fremont stations. BART and all lines of the Muni Metro light rail system share four stations ( Embarcadero, Montgomery Street, Powell Street, and Civic Center/UN Plaza), in the two-level Market Street Subway. Connections are also available to three lines at Balboa Park station and one line at Glen Park station. The under-construction first phase of Silicon Valley BART extension will provide a connection to VTA Light Rail at Milpitas station upon opening. BART is served by bus connections from regional and local transit agencies at all stations, most of which have dedicated off-street bus transfer areas. Many connecting routes (particularly in suburban areas) serve primarily as feeder routes to BART, while others are largely independent. Larger bus systems connecting to BART include Muni in San Francisco, AC Transit in the East Bay, SamTrans in San Mateo County, County Connection and Tri Delta Transit in eastern Contra Costa County, WestCAT in western Contra Costa County, WHEELS in the Tri-Valley, VTA in the Santa Clara Valley, and Golden Gate Transit. Smaller systems include Emery Go Round in Emeryville, Alliance on the Peninsula, San Leandro LINKS, Dumbarton Express, and Union City Transit. The Transbay Transit Center regional bus hub is located one block from Embarcadero and Montgomery stations. Several transit agencies offer limited commuter-oriented bus service from more distant cities to outlying BART stations; these include VINE from Napa County, Solano Express from Solano County, Rio Vista Delta Breeze, Modesto Area Express and Stanislaus Regional Transit from Stanislaus County, and San Joaquin RTD from Stockton. Many BART stations are also served by privately-run employer and hospital shuttles, and privately-run intercity buses stop at several stations. BART hosts car sharing locations at many stations, a program pioneered by City CarShare. Riders can transfer from BART and complete their journeys by car. BART offers long-term airport parking through a third-party vendor  at most East Bay stations. Travelers must make an on-line reservation in advance and pay the daily fee of $5 before they can leave their cars at the BART parking lot. In 2004, BART became the first transit system in the United States to offer cellular telephone communication to passengers of all major wireless carriers on its trains underground. Service was made available for customers of Verizon Wireless, Sprint/Nextel, AT&T Mobility, and T-Mobile in and between the four San Francisco Market Street stations from Civic Center to Embarcadero. In 2009, service was expanded to include the Transbay Tube, thus providing continuous cellular coverage between West Oakland and Balboa Park. In 2010, service was expanded to all underground stations in Oakland (19th Street, 12th Street/Oakland City Center, and Lake Merritt). Uninterrupted cellular coverage of the entire BART system is a goal. As of 2012 [update] passengers in both the Berkeley Hills tunnel and the Berkeley subway (Ashby, Downtown and North Berkeley) received cell service. The only section still not covered by cell service is a short tunnel that leads to Walnut Creek BART, and San Mateo County subway stations (including service to SFO and Millbrae). In 2007, BART ran a beta test of Wi-Fi Internet access for travelers. It initially included the four San Francisco downtown stations: Embarcadero, Montgomery, Powell, and Civic Center. It included above ground testing to trains at BART's Hayward Test Track. The testing and deployment was extended into the underground interconnecting tubes between the four downtown stations and further. The successful demonstration provided for a ten-year contract with WiFi Rail, Inc. for the services throughout the BART right of way. In 2008, the Wi-Fi service was expanded to include the Transbay Tube. BART terminated  the relationship with Wi-Fi Rail in December 2014, citing that WiFi Rail had not submitted an adequate financial or technical plan for completing the network throughout the BART system. A book vending machine at the del Norte station. While the district includes all of the cities and communities in its jurisdiction, some of these cities do not have stations on the BART system. This has caused tensions among property owners in cities like Livermore who pay BART taxes but must travel outside the city to receive BART service. In areas like Fremont, the majority of commuters do not commute in the direction that BART would take them (many Fremonters commute to San Jose, where there is currently no BART service). This would be alleviated with the completion of a BART-to- San Jose extension project and the opening of the Berryessa Station in San Jose. BART, like other transit systems of the same era, endeavored to connect outlying suburbs with job centers in Oakland and San Francisco by building lines that paralleled established commuting routes of the region's freeway system. The majority of BART's service area, as measured by percentage of system length, consists of low-density suburbs. Unlike the Chicago "L" or the London Underground, individual BART lines do not provide frequent local service. Within San Francisco city limits, Muni provides local light rail surface and subway service, and runs with smaller headways (and therefore provides more frequent service) than BART. In the 1970s, BART had envisioned frequent local service, with headways as short as two minutes between trains on the quadruple-interlined section in San Francisco and six minutes on each individual line. However, headways have fallen short of the original plans. While trains do arrive every three minutes on the quadruple-interlined section between West Oakland and Daly City during weekday commute hours, each individual line operates at 15 minute intervals. BART could be characterized as a "commuter subway," since it has many characteristics of a regional commuter rail service, somewhat similar to S-Bahn services in Germany, Denmark, Austria and Switzerland, such as lengthy lines that extend to the far reaches of suburbia, with significant distances between stations. BART also possesses some of the qualities of a metro system  in the urban areas of San Francisco and Oakland; where multiple lines converge, it takes on the characteristics of an urban metro, including short headways and transfer opportunities to other lines. Urban stations are as close as one-half mile (800 m) apart, and have combined 2​1⁄2- to 5-minute service intervals at peak times. Mehserle was arrested and charged with murder, to which he pleaded not guilty. Oakland civil rights attorney John Burris filed a US$25 million wrongful death claim against the district on behalf of Grant's daughter and girlfriend. Oscar Grant III's father also filed a lawsuit claiming that the death of his son deprived him of his son's companionship. On August 15, 2011, there was more disruption in service at BART stations in downtown San Francisco. The San Francisco Examiner reported that the protests were a result of the shootings, including that of Oscar Grant. Demonstrations were announced by several activists, which eventually resulted in disruptions to service. The protesters have stated that they did not want their protests to results in closures, and accused the BART police of using the protests as an excuse for disruption. Protesters vowed to continue their protests every Monday until their demands were met. ^ a b c d e f g "Total Annual Exits FY1973 – FY2017" (xls). BART.gov. San Francisco Bay Area Rapid Transit District. 2017 – via http://www.bart.gov/about/reports/ridership. ^ a b c Chinn, Jerold (January 29, 2015). "Long wait ahead for longer BART trains". San Francisco Bay Area. Retrieved September 29, 2015. BART explains it has total of 662 trains, but about 535 are in service during peak commute times, about 86.5 percent of its fleet. BART said it runs more of its fleet than any other major transit agency despite having the oldest trains in the nation. ^ a b c d e f g h i j k "BART System Facts". San Francisco Bay Area Rapid Transit District. Retrieved March 15, 2016. ^ a b "BART – Car Types". Bay Area Rapid Transit. Retrieved August 23, 2009. ^ a b "BART Sustainable Communities Operations Analysis" (PDF). San Francisco Bay Area Rapid Transit District. June 2013. Retrieved February 5, 2014. Certain sections of the BART system are designed for 80 mph operations, however the maximum operating speed BART currently uses today is 70 mph. It is unlikely that 80 mph operating speeds will be used again due to the increase in motor wear and propulsion failures at the higher rate. There are also higher impacts on track maintenance. In addition, the 80 mph segments tend to be short, and the higher speed benefits are limited as train speeds become inconsistent. ^ "History of BART to the South Bay". San Jose Mercury News. March 12, 2013. Retrieved October 22, 2013. ^ "A History of BART: The Concept is Born". Bart.gov. Retrieved October 22, 2013. ^ "A History of BART: The Concept is Born". Bay Area Rapid Transit (BART). Retrieved January 7, 2007. ^ "A History of BART: the Concept is Born". Retrieved December 1, 2018. ^ "A History of BART: The Project Begins". Bay Area Rapid Transit. Retrieved December 1, 2018. ^ "BART– Not a Moment Too Soon". Los Angeles Times. September 13, 1972. Retrieved March 2, 2011. ^ "BART First in Operation: 2nd great subway boom under way in many cities". The Bulletin. Retrieved August 23, 2009. ^ Gillam, Jerry (November 15, 1972). "Safe Automated BART Train Controls Doubted". Los Angeles Times. Retrieved March 2, 2011. ^ Lembke, Daryl (November 16, 1972). "BART Manager Denies System Was Overcharged by Designers". Los Angeles Times. Retrieved March 2, 2011. ^ Stephen Unger (April 29, 2010). "The BART Case". The Online Ethics Center for engineering and science. Retrieved March 15, 2017. ^ "Troubles Beset Transit System in San Francisco Bay Area". December 9, 1972. Retrieved March 15, 2017. ^ Bill Northwood (November 29, 1972). "What is BART, and why are we saying such terrible things about it?". KPFA Pacifica Radio. p. 2 min : 00 sec. Retrieved March 15, 2017. ^ Peter Sheerin (October 1, 1990). "Bill Wattenburg's Background: BART—Bay Area Rapid Transit System". Retrieved March 15, 2017. Wattenburg challenged the credentials of three successive chief engineers at BART. All of them left or were fired. ^ "Legislative Analyst's Office 75th anniversary". Legislative Analyst's Office (LAO) of the State of California. May 25, 2013. Retrieved March 15, 2017. After the state legislature held a month-long series of hearings on the financial mismanagement at Bay Area Rapid Transit (BART), Alan Post recommended the firing of BART’s general manager. ^ Bill Wattenburg (February 15, 1974). "BART: Countdown to San Francisco". Commonwealth Club of California. p. 28 min : 30 sec. Retrieved March 15, 2017. ^ "BART historical timeline" (PDF). BART. Retrieved March 15, 2017. November 5, 1974, Nine-member Board of Directors elected to replace 12-member appointed board. ^ "Celebrating 40 Years of Service 1972 • 2012 Forty BART Achievements Over the Years" (pdf). Bay Area Rapid Transit (BART). 2012. Retrieved December 2, 2014. ^ "New BART service to Oakland International Airport now open". Bay Area Rapid Transit (BART). November 21, 2014. Retrieved December 2, 2014. ^ Richards, Gary (March 29, 2017). "If you are getting BART service soon, stop your whining". Mercury News. Retrieved March 29, 2017. ^ Cabanatuan, Michael (June 22, 2007). "BART'S New Vision: More, Bigger, Faster". San Francisco Chronicle. Archived from the original on October 10, 2007. Retrieved October 26, 2007. ^ "BART Metro Vision Update" (PDF). Bay Area Rapid Transit (BART). April 25, 2013. Archived from the original (PDF) on July 19, 2014. Retrieved July 15, 2014. ^ Holstege, Sean (July 24, 2002). "BART bond might make ballot in fall". Oakland Tribunal. Retrieved August 23, 2009. ^ Cuff, Denis (May 29, 2007). "BART board wants to lessen waits". Contra Costa Times. Retrieved October 26, 2007. ^ "Good move by BART". Contra Costa Times. October 1, 2007. Retrieved October 26, 2007. ^ Bay Area Rapid Transit. "Off-peak service reductions began Monday, September 14th". Retrieved May 30, 2013. ^ "Earthquake Safety Program Technical Information". Bay Area Rapid Transit District. Retrieved November 8, 2010. ^ "Earthquake Safety Program". Bay Area Rapid Transit District. February 11, 2013. Retrieved February 5, 2014. ^ "The Four-Year Fight to Make San Francisco's Subway Stop Screaming". Wired. September 2, 2016. ^ "BART reduces trains speeds, station lighting, to help PG&E and state power grid". July 24, 2006. Retrieved September 26, 2015. BART doesn't typically run trains at their maximum speed of 80 mph except to help a train make up time. ^ "BART Train length". Google Groups: ba.transportation. July 3, 2000. Retrieved January 7, 2007. ^ Paul Garbutt (1997). "Facts and Figures". World Metro Systems. Capital Transport. pp. 130–131. ISBN 1-85414-191-0. ^ Gafni, Matthias (March 25, 2016). "Has BART's cutting-edge 1972 technology design come back to haunt it?". San Jose Mercury News. Retrieved March 28, 2016. ^ "Schedules". Bay Area Rapid Transit District. Retrieved February 14, 2019. ^ a b c "New Train Car Project". Bay Area Rapid Transit District. Retrieved January 29, 2018. ^ a b "February 11 schedule change impacts weekdays and Sundays" (Press release). San Francisco Bay Area Rapid Transit District. January 15, 2019. ^ "Rail Capacity Improvement Study for Heavy Rail Transit Operations" (PDF). Federal Transit Administration. October 2012. p. 52. ^ McDermid, Riley (November 17, 2017). "No turkey for you: BART says new trains won't be running by Thanksgiving after all". San Francisco Business Times. Retrieved January 19, 2018. ^ Cabanatuan, Michael (April 10, 2010). "BART can't keep pace with rising 'crush loads'". SFGate. ^ ""Why can't the trains be longer?" Some background to explain". BART. September 25, 2008. Archived from the original on August 27, 2009. Retrieved August 23, 2009. ^ "East Contra Costa BART Extension (eBART) Implementation". Bay Area Rapid Transit (BART). May 19, 2015. Retrieved August 9, 2015. ^ a b "Onsite testing begins for BART's first new train car". www.bart.gov. April 6, 2016. Retrieved April 22, 2016. ^ "Stadler Rail delivers trains to Oakland". Stadler Rail. April 26, 2014. Archived from the original on March 4, 2016. Retrieved August 9, 2015. ^ Richman, Josh (May 10, 2012). "BART board approves contract for 410 new train cars". San Jose Mercury News. Retrieved May 11, 2012. ^ Bowen, Douglas John (May 11, 2012). "BART taps Bombardier; U.S. content at issue". Railway Age. Retrieved May 11, 2012. ^ "Board Meeting Agenda" (PDF). San Francisco Bay Area Rapid Transit District. November 21, 2013. pp. 91–92. Retrieved December 5, 2013. ^ Rodriguez, Joe Fitzgerald (November 7, 2017). "BART's new train cars fail regulatory test, possibly delaying rollout". San Francisco Examiner. Retrieved November 8, 2017. ^ Cabanatuan, Michael (January 18, 2018). "New BART rail cars approved for service". San Francisco Chronicle. ^ Brinklow, Adam (January 19, 2018). "New BART cars go into service today". Curbed SF. Retrieved January 19, 2018. ^ "New Train Car Project Delivery Plan". Bay Area Rapid Transit (BART). 2017. Retrieved January 18, 2017. ^ "Transit Information: Late Night Bus Services" (PDF). Metropolitan Transportation Commission. May 24, 2018. ^ "Early Bird Express" (PDF). San Francisco Bay Area Rapid Transit District. 2019. 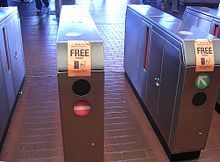 ^ "BART Unveils Modern Fare Gates and New Ticket Vending Machines". Business Wire. Retrieved August 23, 2009. ^ "BART – ticket refunds and exchanges". BART. Archived from the original on September 22, 2006. Retrieved January 22, 2007. ^ Jon Carroll (December 6, 2000). "Tiny Tickets Ha Ha Ha Ha". The San Francisco Chronicle. Retrieved January 7, 2007. ^ "QuickPlanner >> Results between Downtown Berkeley and North Berkeley". BART. Archived from the original on January 9, 2009. Retrieved January 7, 2007. ^ "BART 2018 Fare Table" (PDF). BART.gov. Retrieved April 25, 2018. ^ "QuickPlanner >> Results between Pittsburg/Bay Point and SFO". BART. Retrieved April 8, 2013. ^ "BART Ticket Types". BART. Archived from the original on September 22, 2006. Retrieved January 26, 2014. ^ "Capitol Corridor Ride Guide" (PDF). The Capitol Corridor. Archived (PDF) from the original on January 21, 2007. Retrieved January 7, 2007. ^ "The Capitol Corridor: BART Connections". The Capitol Corridor. Archived from the original on October 11, 2006. Retrieved January 7, 2007. ^ "SFMTA Advises Customers of Muni Fare Increases for January 2010". San Francisco Municipal Transportation Agency (SFMTA). December 17, 2009. Retrieved February 26, 2015. ^ "Today's free lecture: fare idea falls flat". Inside Bay Area. September 19, 2006. Archived from the original on October 19, 2006. Retrieved January 22, 2007. ^ "Total Annual Exits FY1973 – FY2014" (xls). BART.gov. San Francisco Bay Area Rapid Transit District. 2014. Retrieved April 3, 2015 – via http://www.bart.gov/about/reports/. ^ "BART reports record ridership and progress on escalator repair". Bay Area Rapid Transit (BART). August 9, 2012. Retrieved April 3, 2015. ^ "BART can't keep pace with rising 'crush loads'". SFGate. Retrieved March 2, 2017. ^ "October BART ridership soaring". BART. Retrieved October 18, 2012. ^ "Uber and Lyft use at SFO increases six-fold in two years, BART loses ridership". December 5, 2016. Retrieved December 8, 2016. BART officials told the agency’s Board of Directors...that increased Uber and Lyft ridership led to less passengers taking BART in 2016…BART’s overall ridership rate of growth “rapidly slowed,” according to a staff presentation. In October overall ridership was down to 438,000 trips for the average weekday, 1.7 percent less than the same time the year prior. ^ "Ripple effect of Metro's troubles: plummeting bus ridership across the region". February 20, 2016. Retrieved December 8, 2016. falling bus ridership in the Washington region mirrors a national trend that experts say is due to a variety of factors, including changing job markets, falling gas prices and the growing popularity of other transportation options such as biking and app-based services such as Uber and Lyft. ^ "What Factors Are Causing Metro's Declining Ridership? What Next?". January 29, 2016. Retrieved December 8, 2016. ^ "Uber and Lyft use at SFO increases six-fold in two years, BART loses ridership". December 5, 2016. Retrieved December 8, 2016. BART’s train line to the San Francisco International Airport is losing riders and losing money. And that culprit is competition from the private sector, BART staff said. Uber and Lyft in particular have seen their ridership at SFO rise by almost six times over from 2014 to 2016, according to data provided by SFO to the San Francisco Examiner...BART’s SFO ridership was discussed during a presentation at the Board of Directors meeting. ^ "Uber and Lyft use at SFO increases six-fold in two years, BART loses ridership". December 5, 2016. Retrieved December 8, 2016. Uber and Lyft in particular have seen their ridership at SFO rise by almost six times over from 2014 to 2016, according to data provided by SFO to the San Francisco Examiner. BART officials told the agency’s Board of Directors at its regular meeting Thursday that increased Uber and Lyft ridership led to less passengers taking BART in 2016. “We believe Uber and Lyft are impacting our ridership,” Carter Mau, executive manager of BART’s office of planning and budget, told the San Francisco Examiner outside the meeting. ^ "Average Weekday Exits by Station" (xls). BART. Retrieved June 16, 2017. ^ a b c d "Warriors parade BART's second highest ridership day". BART. June 20, 2015. Retrieved June 22, 2015. ^ a b c d Alexander, Kurtis (February 7, 2016). "Super Bowl helps BART crush weekend-day ridership record". San Francisco Chronicle. Retrieved February 9, 2016. ^ "Warriors parade 5th-highest ridership day in BART history". BART.gov. June 16, 2017. ^ "Latest Warriors parade leads to top-10 ridership day for BART". BART.gov. June 13, 2018. ^ "BART marks all-time highest ridership day in 40 years of service". BART. October 31, 2012. Retrieved November 1, 2012. ^ "World Series parade boosts BART ridership to highest day ever – past half-million". BART. November 4, 2010. Retrieved January 31, 2012. ^ "11.01.2009 BART customers continue to set ridership records". Bart.gov. Archived from the original on November 20, 2010. Retrieved December 29, 2010. ^ "BART ridership soars during Bay Bridge closure". KTVU. August 30, 2013. Archived from the original on September 6, 2013. Retrieved September 7, 2013. ^ "BART ends milestone week with a record; next challenge: playing catch-up". BART. February 8, 2016. Retrieved February 9, 2016. ^ "BART shatters Saturday ridership record, adds capacity for Sunday". BART. October 7, 2012. Retrieved October 12, 2012. ^ a b "Pride Parade Service Breaks Sunday Ridership Record". BART. June 30, 2013. Retrieved July 3, 2013. ^ "BART parking overview". BART. Archived from the original on September 22, 2006. Retrieved January 7, 2007. ^ Richards, Gary (October 7, 2015). "Opening of BART Warm Springs station pushed back to next year". San Jose Mercury News. Retrieved October 9, 2015. parking after 10 a.m. at any BART station is difficult. Here are the southern Alameda County stations where you might get lucky and find parking in this order: South Hayward, Hayward, Union City, West Dublin/Pleasanton and Castro Valley.... BART is testing the feasibility of posting real-time information that would let a driver check whether spots are available at a particular station. Right now, the best it can do is to provide estimates on its website for when parking lots will be full. ^ "Long-Term Parking for Travelers". BART. Archived from the original on September 22, 2006. Retrieved January 7, 2007. ^ Michael Cabanatuan (November 19, 2005). "Underground, but not unconnected – BART offers wireless service to riders". San Francisco Chronicle. Retrieved January 22, 2007. ^ BART expands wireless access to Transbay Tube, BART, December 21, 2009. Retrieved December 21, 2009. ^ BART expands wireless network to underground stations in downtown Oakland, BART, August 27, 2010. Retrieved November 5, 2011. ^ "WiFi Rail Inc. to provide wifi access on BART system". BART. February 2009. Retrieved February 2, 2009. ^ "WiFi Rail Tube Access". KRON 4. June 2009. Retrieved June 18, 2009. ^ "BART scraps Wi-Fi contract, prompting threats of legal action". Retrieved July 6, 2016. ^ Elinson, Zusha (August 11, 2011). "BART Cuts Cell Service to Foil Protest". The Bay Citizen. Retrieved September 25, 2011. ^ "US regulators seek input on cell phone interruptions". March 2, 2012. Retrieved January 2, 2016. ^ Rachel Lackert (May 1, 2012). "BART Cell Phone Service Shutdown: Time for a Virtual Forum?". Retrieved January 2, 2016. this unilateral action raised significant legal questions as to whether this was authorized under federal telecommunications law relating to the right of the passengers to access the telephone network and the legality of a shutdown by a quasi-governmental authority such as BART. Additionally, BART’s actions raised issues concerning the First Amendment rights of the passengers and protesters to freedom of speech and assembly. ^ "BART's Cell Phone Shutdown, One Year Later". August 12, 2012. Retrieved January 2, 2016. ^ a b c d "Library-a-Go-Go comes to El Cerrito del Norte BART Station". Bart.gov. June 15, 2009. Retrieved August 21, 2011. ^ "In California, a New ATM for Books Debuts". Libraryjournal.com. Retrieved August 21, 2011. ^ "Self-Service to the People". Libraryjournal.com. Archived from the original on April 18, 2011. Retrieved August 21, 2011. ^ "Library book lending machine opens at Millbrae BART Station". Bart.gov. Retrieved August 21, 2011. ^ "BART Police". BART. Archived from the original on August 26, 2009. Retrieved August 23, 2009. ^ "BART's Livermore role reviewed". Contra Costa Times. July 17, 2003. Retrieved August 23, 2009. ^ "BART 2005 Annual Report" (PDF). Archived from the original (PDF) on September 22, 2006. Retrieved August 28, 2006. "BART 2005 Annual Report". BART.gov. Archived from the original (TXT) on September 23, 2006. Retrieved January 7, 2007. ^ "BART 2016 Factsheet" (PDF). BART.gov. Bay Area Rapid Transit. Retrieved April 18, 2016. ^ Griffin, Melissa (June 13, 2013). "BART labor seeking more money for not laboring". The San Francisco Examiner. ^ "San Francisco rail strike continues as commuters face third day of chaos". The Guardian. London. AP. July 3, 2013. ^ W. S. Homburger. "The impact of a new rapid transit system on traffic on parallel highway facilities". 1029-0354, Volume 4, Issue 3. Transportation Planning and Technology. Retrieved August 24, 2009. ^ "Fact Book Glossary – Mode of Service Definitions". American Public Transportation Association. 2013. Retrieved November 12, 2013. ^ "Passenger Rail Issues". East Bay Bicycle Coalition. Archived from the original on February 22, 2007. Retrieved January 22, 2007. ^ "Rapid transit". Merriam-Webster. Retrieved February 27, 2008. ; "Metro". International Association of Public Transport. Archived from the original on June 27, 2013. Retrieved February 27, 2008. ^ Geoffrey Hunter (2005). Oakland Fire Department. Arcadia Publishing. p. 95. ISBN 978-0-7385-2968-4. ^ Gordon, Rachel; Bulwa, Demian; Jones, Carolyn (October 15, 2008). "BART train kills worker on tracks in Concord". San Francisco Chronicle. Retrieved December 29, 2010. ^ Eskenazi, Joe (February 2, 2009). "BART Accused of Being Late – in Paying Out to Survivors of Track Inspector Killed by Train". San Francisco News – The Snitch. Blogs.sfweekly.com. Archived from the original on January 5, 2011. Retrieved December 29, 2010. ^ Jill Tucker; Kelly Zito; Heather Knight (January 2, 2009). "Deadly BART brawl – officer shoots rider, 22". San Francisco Chronicle. Archived from the original on January 4, 2009. Retrieved January 5, 2009. ^ Eliott C. McLaughlin; Augie Martin; Dan Simon (2009). "Spokesman: Officer in subway shooting has resigned". CNN. Retrieved January 5, 2009. ^ Terry Collins (January 11, 2009). "Transit board gets another earful on Oakland death". Associated Press. Archived from the original on January 12, 2009. ^ Maria L. La Ganga (January 13, 2009). "BART board creates commission to oversee transit police". Los Angeles Times. ^ Rachel Gordon; Steve Rubenstein (January 9, 2009). "BART directors apologize to slain man's family". San Francisco Chronicle. Archived from the original on January 16, 2009. Retrieved January 8, 2009. ^ Cuff, Denis (January 27, 2009). "Second BART director wants new general manager". Contra Costa Times. Archived from the original on March 10, 2012. Retrieved February 3, 2009. ^ Elinor Mills (2009). "Web videos of Oakland shooting fuel emotions, protests". CNET Networks. Retrieved January 9, 2009. ^ Demian Bulwa; Charles Burress; Matthew B. Stannard; Matthai Kuruvilaurl (January 8, 2009). "Protests over BART shooting turn violent". San Francisco Chronicle. Archived from the original on January 16, 2009. Retrieved January 8, 2009. ^ "BART Shooting: Family Suing BART For $25 Million". KTVU. 2009. Archived from the original on January 16, 2009. Retrieved January 4, 2009. ^ "Jury Finds Mehserle Guilty Of Involuntary Manslaughter". KTVU. July 8, 2010. Archived from the original on July 14, 2010. Retrieved December 29, 2010. ^ Bulwa, Demian (June 14, 2011). "Johannes Mehserle, ex-BART officer, leaves jail". San Francisco Chronicle. Retrieved August 21, 2011. ^ Upton, John (July 25, 2011). "BART Police Release Video of Shooting – Pulse of the Bay". The Bay Citizen. Archived from the original on July 23, 2012. Retrieved August 21, 2011. ^ Murphy, David (August 13, 2011). "To Prevent Protests, San Francisco Subway Turns Off Cell Signals, August 13, 2011". PC Magazine. Retrieved August 18, 2011. ^ "S.F. subway muzzles cell service during protest". CNET. ^ "Questions, Complaints Arise Over BART Cutting Cell Phone Service". KTVU. Archived from the original on October 5, 2011. ^ "Leland Yee scolds BART over cell phone blackout". KGO-TV. ^ "BART Under Fire From Hackers, Critics, Employees". KTVU. Archived from the original on October 5, 2011. ^ "Hackers Escalate Attack On BART; User IDs Stolen". KTVU. Archived from the original on October 5, 2011. ^ "Shadowy Internet group Anonymous attacks BART website". San Francisco Examiner. Archived from the original on June 17, 2012. ^ "BART runs without problems despite protest threats". KGO-TV. ^ "BART Warns Commuters Of Potential Protest Disruptions". KTVU. Archived from the original on January 27, 2013. Retrieved August 18, 2011. ^ "BART Warns Commuters Of Potential Protest Disruptions". NBC Bay Area. ^ "Protesters storm BART, slow commute out of San Francisco". San Francisco Examiner. Archived from the original on December 16, 2011. ^ "BART warns passengers of possible protests at San Francisco stations Thursday". San Francisco Examiner. Archived from the original on July 28, 2012. ^ Protest plan for OpBART-3 Archived March 31, 2012, at the Wayback Machine Plan for further protests by OpBART. ^ Crawford, Susan (September 25, 2011). "Phone, Web Clampdowns in Crises Are Intolerable". Bloomberg News. ^ "Cell Service Interruption Policy" (PDF). Bay Area Rapid Transit District. December 2011. Archived from the original (pdf) on December 18, 2011. Retrieved March 30, 2012. ^ a b Wyatt, Edward (March 2, 2012). "F.C.C. Asks for Guidance on Whether, and When, to Cut Off Cellphone Service". The New York Times. ^ Crowell, James (February 22, 2012). "BART Officer Who Shot Charles Hill, 'Acted Lawfully' According To District Attorney". Huffington Post. ^ "Video of 2013 Fatal BART Accident Reveals Safety Lapses: Regulators". NBC Bay Area. April 13, 2017. Retrieved May 22, 2017. Owen, Wilfred (1966). The metropolitan transportation problem. Anchor Books. BART: a study of problems of rail transit. California. Legislature. Assembly. Committee on Transportation. 1973. Richard Grefe (1976). A history of the key decisions in the development of Bay Area Rapid Transit. National Technical Information Service. E. Gareth Hoachlander (1976). Bay Area Rapid Transit: who pays and who benefits?. University of California. Cervero, Robert (1998). The transit metropolis: a global inquiry. Island Press. ISBN 1-55963-591-6. University of California (1966). The San Francisco Bay area: its problems and future, Volume 2. University of California. Wikimedia Commons has media related to BART.